This new collection explores recent patterns in health care regulation, financing, and delivery across countries. 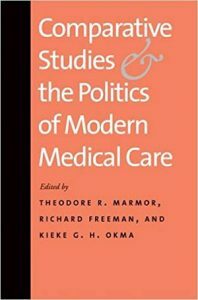 Wide-ranging essays cover both key countries (Canada, Germany, Holland, the United Kingdom and the United States) and key issues, including primary care, hospital care, long-term care, pharmaceutical policy, and private health insurance. Respective authors pay close attention throughout to the ways in which cross-national, comparative research informs national policy debates across the world.